Another journal. Starting with sad news. On Wednesday 8-10-2014, Aric’s brother in law, passed away. A few days earlier we had met Victor and his family during a wedding dinner. Here he is sitting to the right with his wife and two kids, still in good health. During the weekend he developed a fever and on Wednesday Aric took him to the hospital. A few hours later he passed away: blood poisoning (septicemia). How fragile life is. 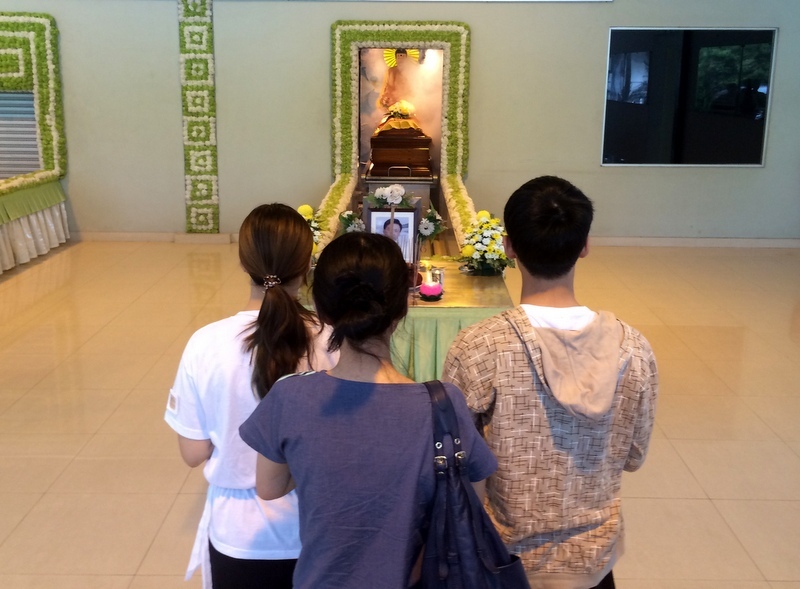 Hectic days followed, cremation on the following Saturday. Less than one week later, our planned visit to Japan started. We considered canceling the trip, but decided to go. It was a good decision. Reports about Osaka, Kyoto and Wakayama have been published separately already. Here a picture of a Zen garden. Back in Malaysia, we were invited for the 60th birthday party of our friend Zen. In a very different style: a polka dot and swinging sixties party. A very pleasant evening! I am still a regular walker in Bukit Kiara. The original Kiara Bunch has more or less dwindled away, only my friend Boon Chee is left over. So I often walk alone, but sometimes with friends whom I show the beauty of the hill. Here some pictures of two walks, one with Paul, another one with Rani. When you have been following my blog, you will know that Bukit Kiara is under threat. Development is taking place and the plans to gazette it have not yet materialised. But at least there are plans to protect it. The situation is much worse for Bukit Lanjan, opposite our condo. 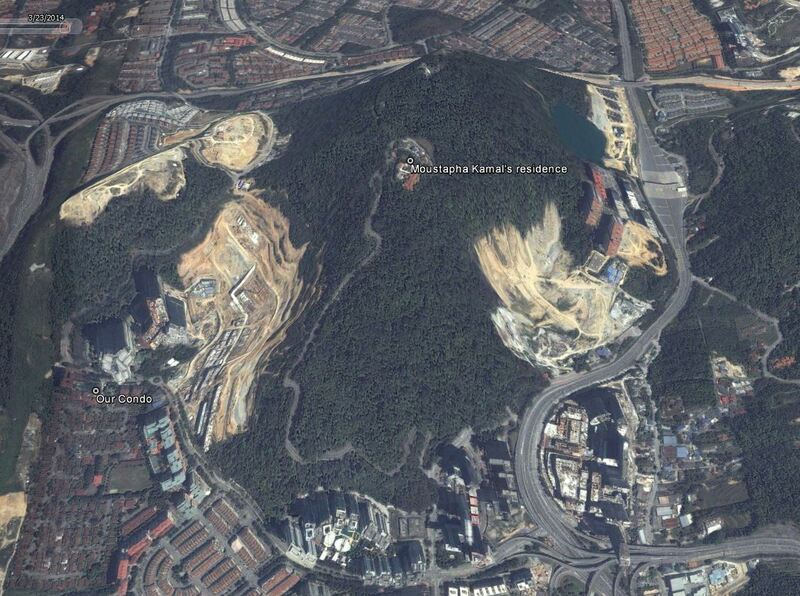 The hill is basically the property of real estate developers..:-( Mainly MK Land, but now also Mammoth Empire. 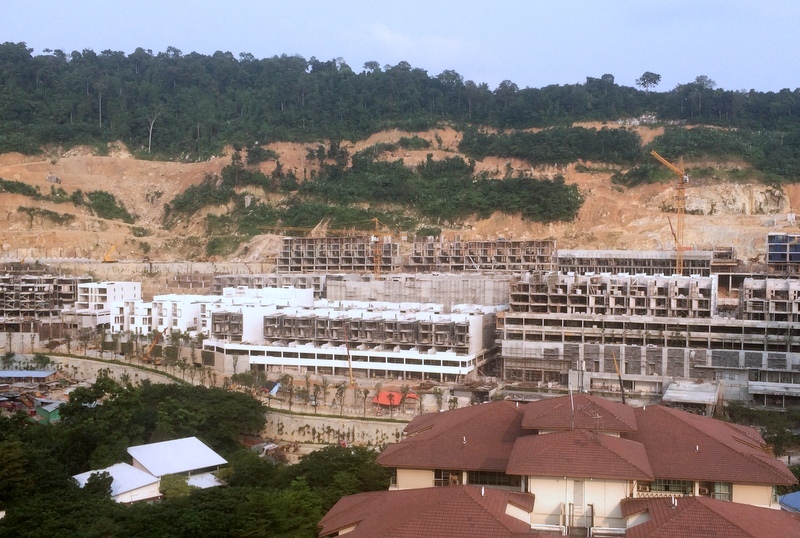 We chose our condo in Damansara Perdana mainly because of the splendid view of the forested Bukit Lanjan slope, as seen from our balcony. Have a look at how it was when we bought it, and the present situation! 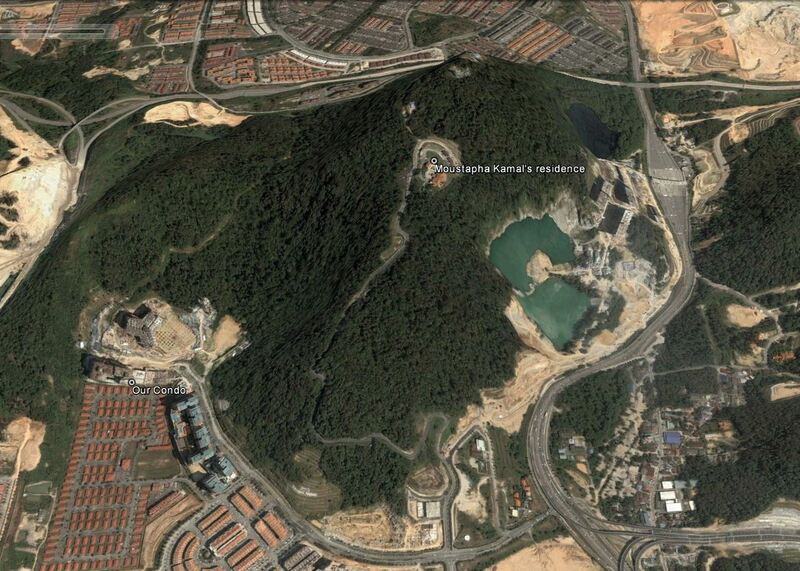 Here are two more pictures, Google Earth screenshots, to show clearly how Mustapha Kamal (the big boss of MK Land) has created his own paradise on top of Bukit Lanjan, in the meantime destroying the hill. Like Saruman in Lord Of The Rings… 🙁 Click on the pictures to enlarge and see details. Left the situation in 2010, right as it was beginning of this year. Sad. 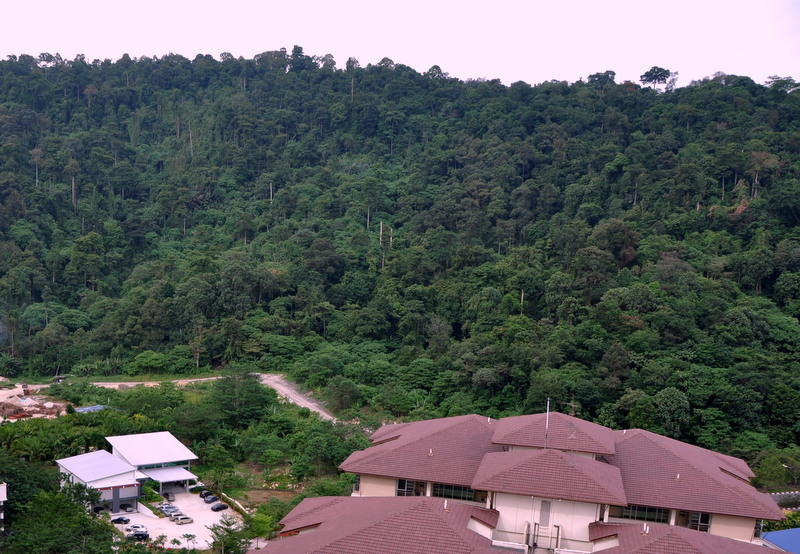 Another popular location for walking and jogging is the Forest Research Institute Malaysia (FRIM). I have been there a few times, but do not know the location well, so I was happy to accept my friend’s Edwin invitation for a hike. Here are a a few pictures. Of course I also visited waterfalls, although I have become much more careful recently. I guided my late friend Yian’s daughter Carolline and her NZ boyfriend Dave to the Kanching waterfalls. And I joined Edwin to a “secret” waterfall, recently discovered by him. Last weekend I was back in Taiping. On 23-11 the Taping Heritage Society had organised a day trip for its members and the Committee had asked me to tell the participants about the Kota Ngah Ibrahim in Matang. I had collected a lot of information, you can find it here About the trip irself I will write a separate post. 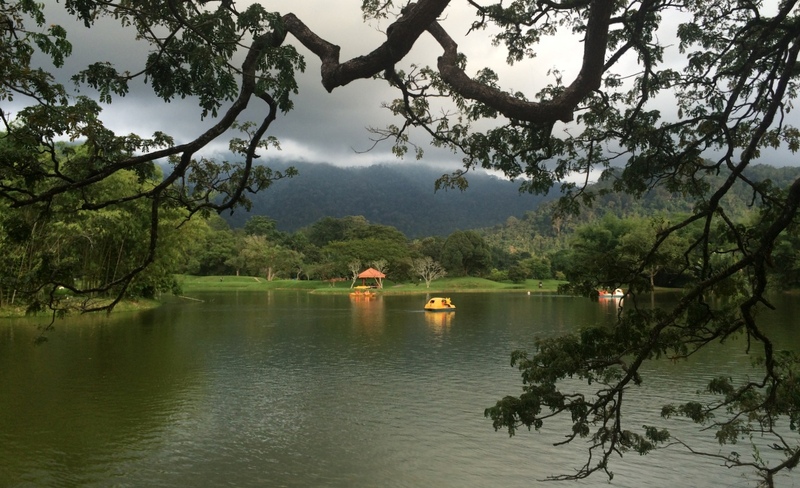 It is always a pleasure to visit the Lake Gardens in Taiping. In two earlier posts I have reported about the exciting space adventure of Rosetta, a spacecraft launched in 2004 with as destination a comet, the 67P/Tsjoerjoemov-Gerasimenko. The first post, Wake up, Rosetta!, described how, after a hibernation of more than two and a half years, Rosetta woke up in January 2014, according to plan. The second post, Rosetta meets 67P, published last August, reports how Rosetta successfully goes into orbit round the comet. 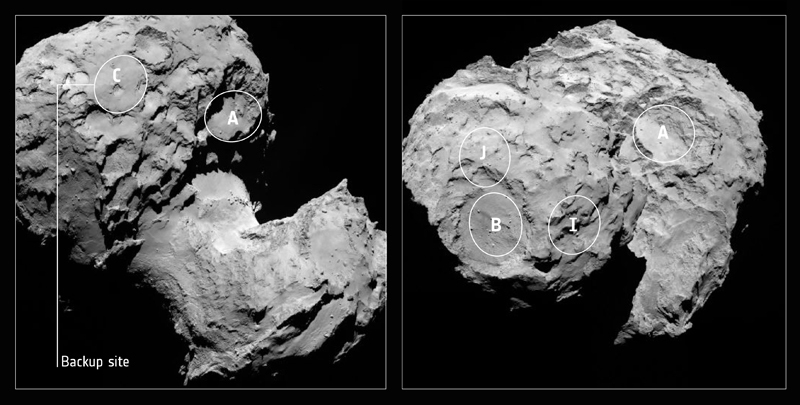 It turns out that the comet has a strange shape, like a rubber bathtub duck. Here is a picture, taken on 19 September at 28.6 km from the center of the comet. The head points to the right. If you look carefully you will see a kind of smoke coming from the “neck” of the comet. That is the coma, part of the comet material is evaporating because it is approaching the sun. 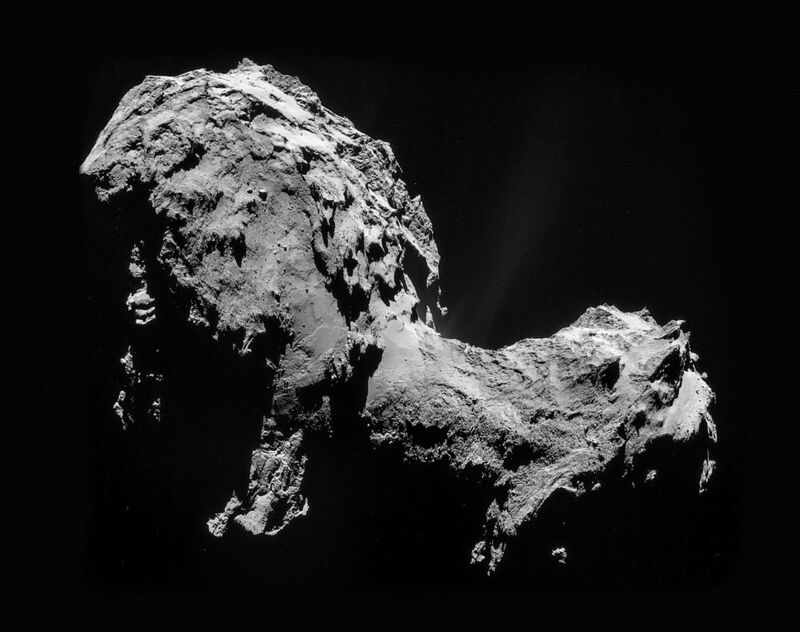 Later, closer to the sun, 67P will develop the characteristic comet “tail”. The comet is rotating with a period of 12 hours and 36 minutes. But the ultimate goal of the expedition is to land a module on the comet itself! This module has been called Philae and you can see it here still attached to Rosetta. The last few months, the scientists have been working hard to find a suitable landing site for Philae. That has not been a simple job, because of the complicated structure of the comet. The landing site should be relatively flat and smooth. Several options have been studied, finally the decision was made to choose location J, on the head of the duck in the picture below. The landing site has now been renamed Agilkia. Why? Google and find out yourself 🙂 Hint: there is a relation with Rosetta and Philae. The critical landing operation will take place on Wednesday November 12. At 8:35 GMT Philae will be deployed from Rosetta and start its slow fall to the comet. It has no thrusters that can change its course, so ultimate precision is required in the timing of the separation. Keep also in mind that the distance between earth and the comet is at the moment about 500 million km, so signals take time to reach Rosetta. To be exact: 28 minutes and 20 seconds one way! So it will be 9:03 GMT before we know if the separation has been successful. Falling to the comet? Yes, because the gravitational attraction of the comet is very small, but it exists. The falling proces willl take about 7 hours! And the speed at landing will be “only” ~ 1m/s. For comparison, that is the speed an object would get here on earth, when it falls 5 cm! 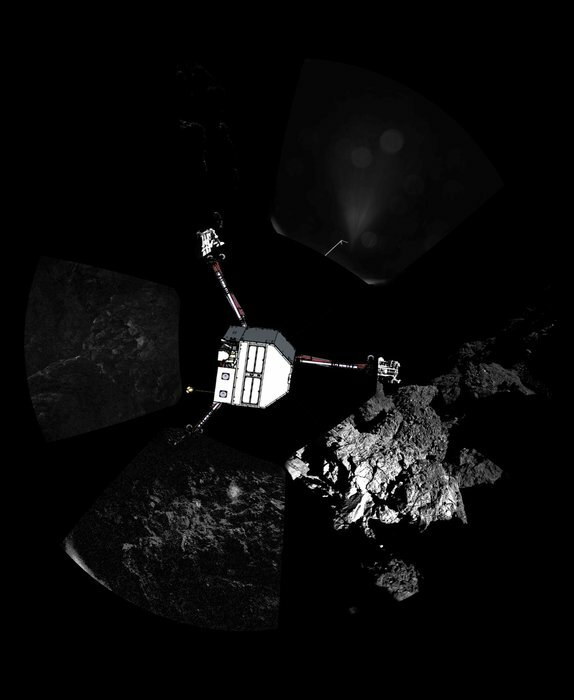 As soon as Philae touches the surface of the comet, two harpoons will be fired down to anchor the module. Otherwise it might bounce back into space! Here is an artist impression of a successful landing. 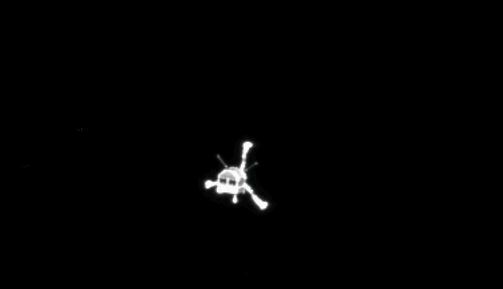 The two red lines under Philae are the harpoons. The construction of the three supporting “legs” allows landing on moderate slopes. If the slope is steeper than 30 degrees, the Philae might topple over, resulting in failure. The whole procedure is considered a risky one, success estimates of 75% “only” have been mentioned.. So let us keep our fingers crossed Wednesday! Malaysian time is GMT + 8 hrs, Dutch time is GMT + 1 hr. 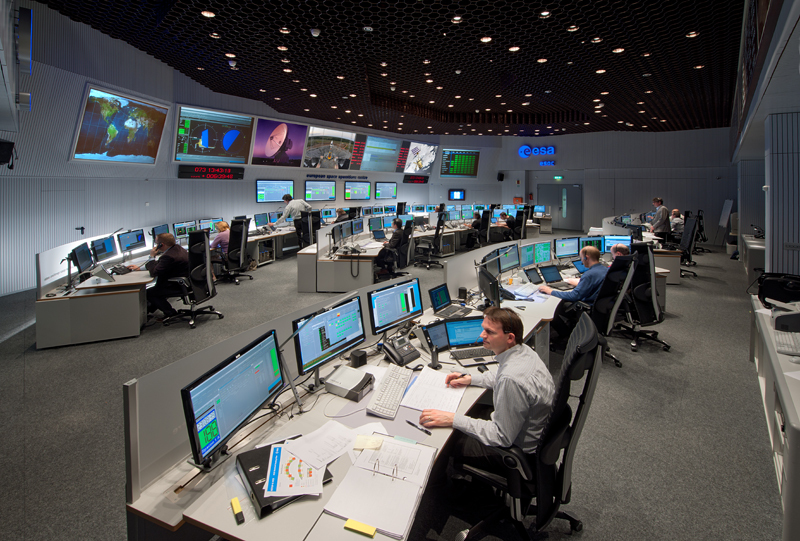 Here is the ESA control room. How many nails will be bitten on that day, waiting seven hours, while you can do nothing…:-)? The Live broadcast has started already. It is still early in Darmstadt, people are arriving in the ESOC control room, where it is obviously quite cold…:-) Many sniffy people. The last few days pictures have been taken by Rosetta with amazing details. Click here for a collection. Here is a spectacular one. 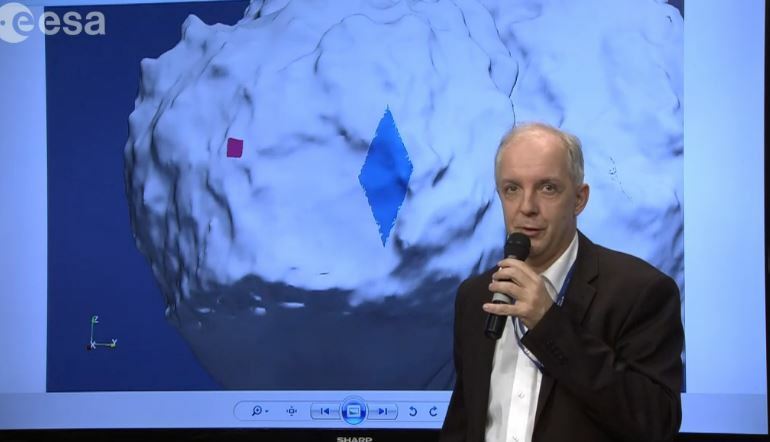 Just watched an interview with Gerhard Schwehm, mission manager of the Rosetta project. Now retired. I did not realise that the project started in 1985, almost 30(!) years ago. Less than one hour now until separation. I have been naive..:-) Thinking that at this moment the command should be sent to Rosetta to deploy Philae (because it takes 28 minutes for the signal to reach Rosetta). 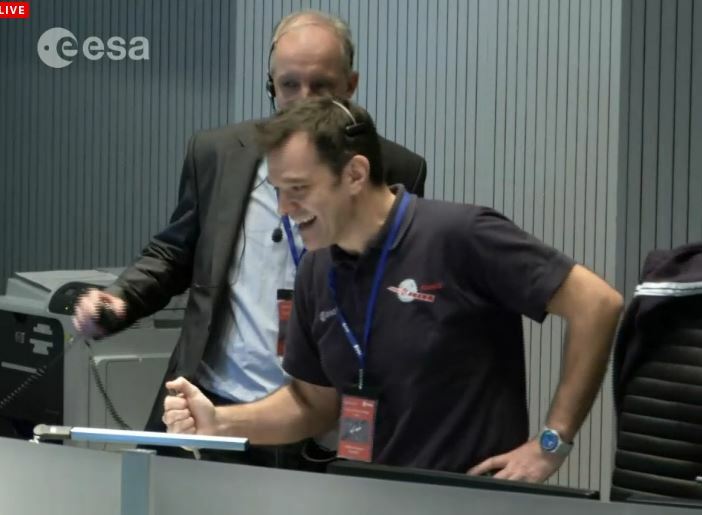 But of course they will not do it that way..:-) Rosetta has been programmed to deploy Philae at 8:35am ! 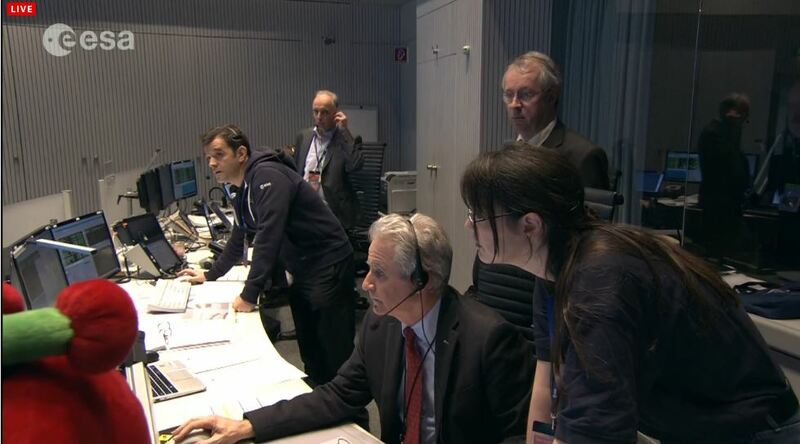 Around 9am GMT the ESOC will know if that separation has been successful. 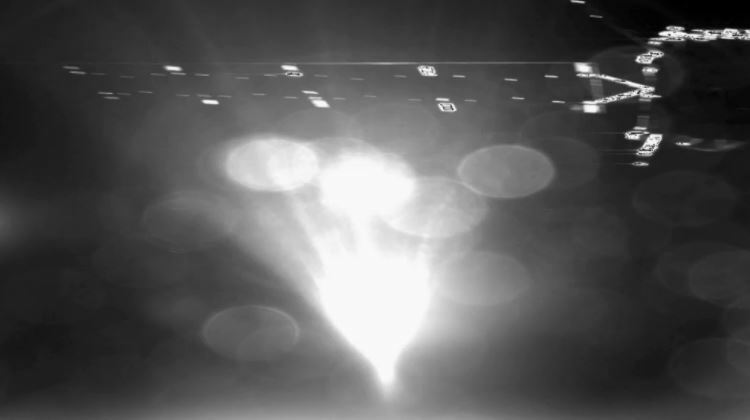 At this moment, 511 million km away, the Philae is starting its fall to the comet 67P. In spite of a problem that has been found in the lander. 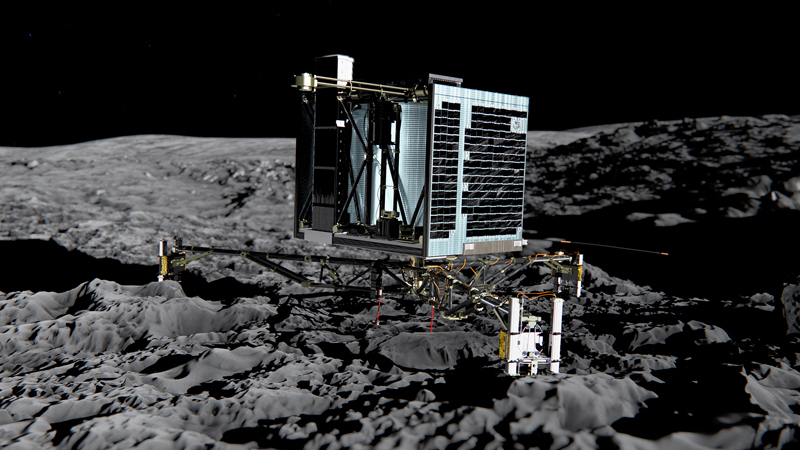 As explained in my post, the Philae could bounce back after touching the surface of the comet. Therefore two harpoons are fired at touchdown to anchor it. Also, on top of the Philae, an amount of gas should be released, giving the Philae an extra push to the surface. It seems that this “thruster” doesn’t work properly.So everything will now depend on the harpoons. 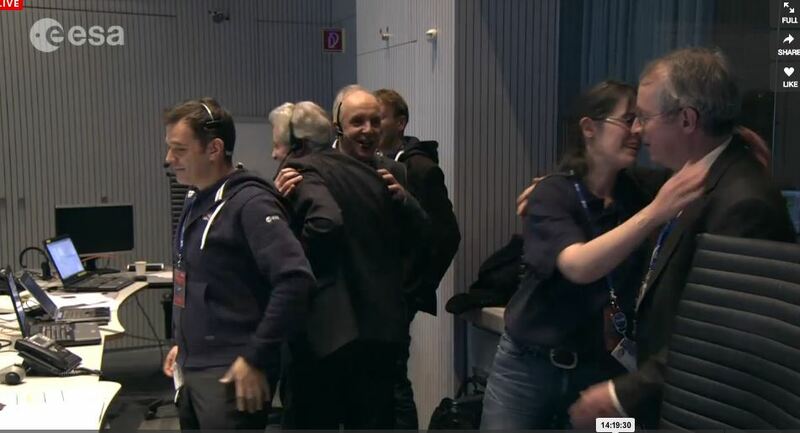 Contact established between Philae and Rosetta! Great! This is a bigger step than the deployment. 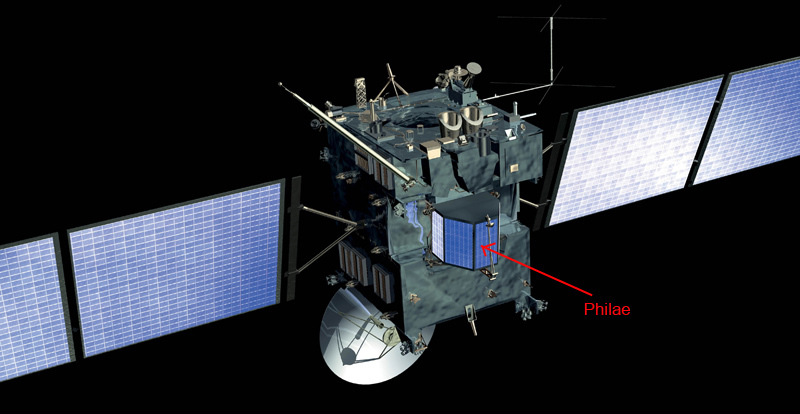 Philae is too weak to communicate directly with Earth, it has to do that via Rosetta. And it did! So now we can follow its descent to the comet, and it may even be able to send pictures. 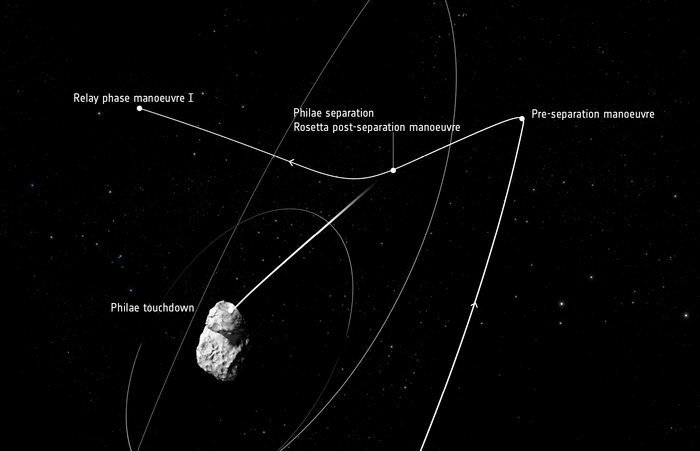 Telemetry data from Philae show that it is following the calculated trajectory accurately. The landing will be the most critical part. 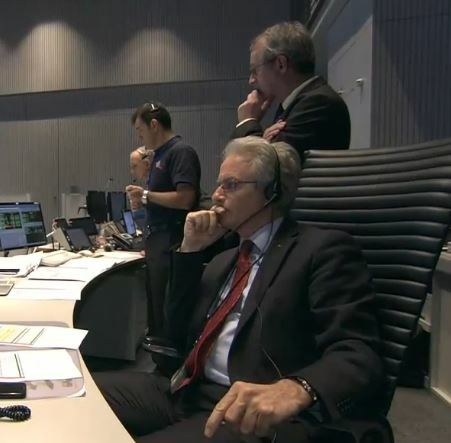 Everybody at Esoc keeps his/her fingers crossed. Here is an image taken by Rosetta’s Osiris camera of the descending Philae lander. Amazing. The landing arms are out. 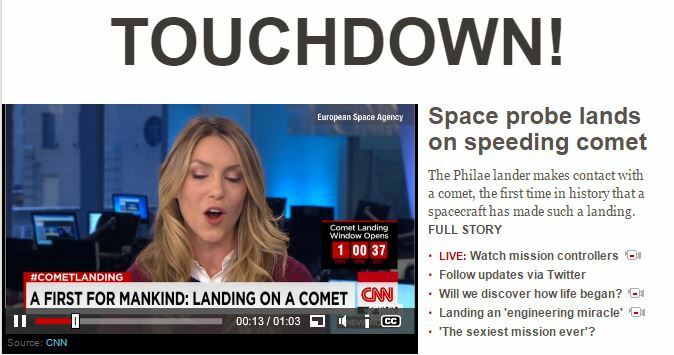 Waiting now for news about the landing. Personally I do no like the optimistic way of talking about success. There is a reasonable chance of failure, and then the disappointment will be huge. Because the Philae is not anchored, some of the planned experiments (like drilling to obtain and analyse some comet material) will be risky, as the lander might loose its balance and topple over. 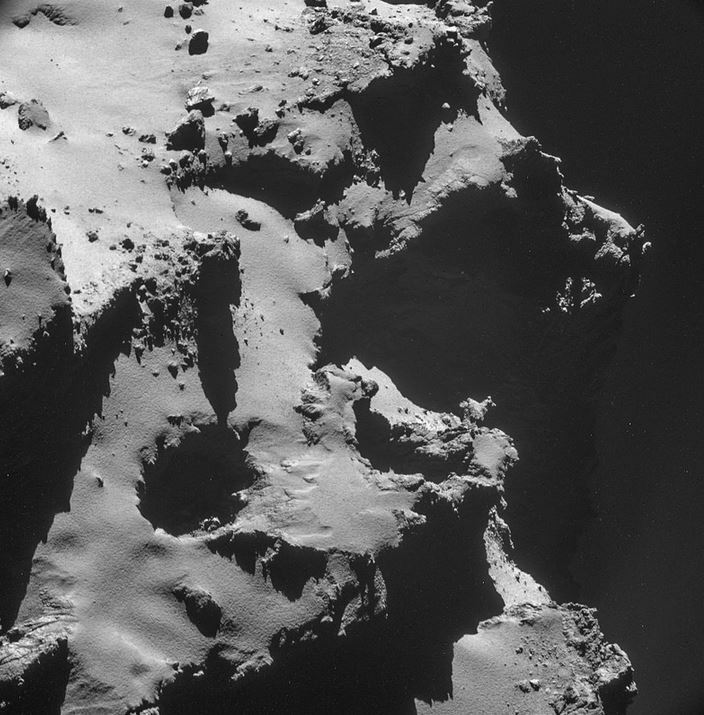 It seems that the Philae has landed in a location that is more rocky than intended, maybe even beside a cliff. Those rocks may obstruct sunlight from reaching the solar panels of Philae. At the moment Philae is using the energy of its batteries, but soon it will depend on solar energy. So there are minor(?) problems, which can hopefully be solved. Still the landing is an awesome achievement and at the moment the lander is already collecting scientific data and sending them to Rosetta. Also pictures of the surroundings have been taken. Here are first results, not yet fully processed. To the left a series of six “panoramic” pictures. On some of them a foot of the Philae can be seen. 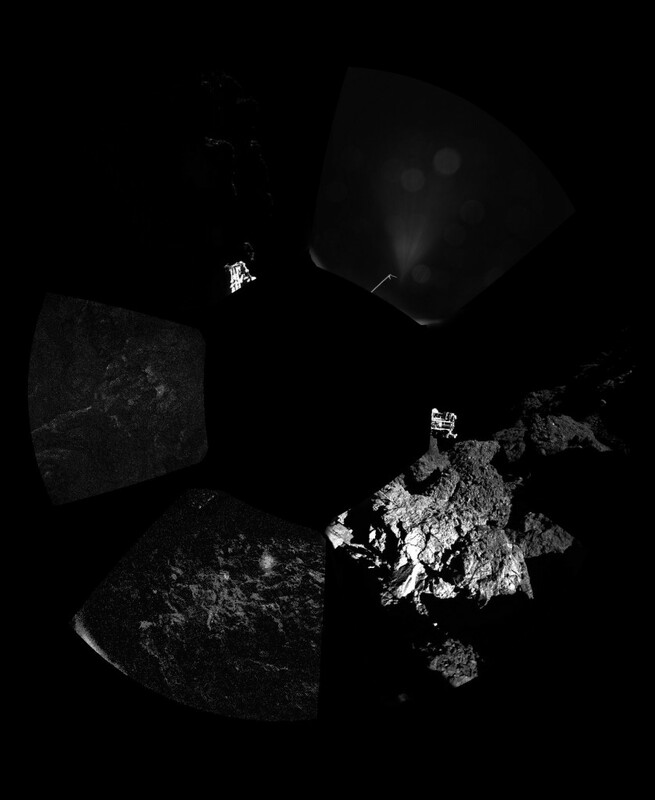 The collage to the right shows the same pictures, but with Philae superimposed. 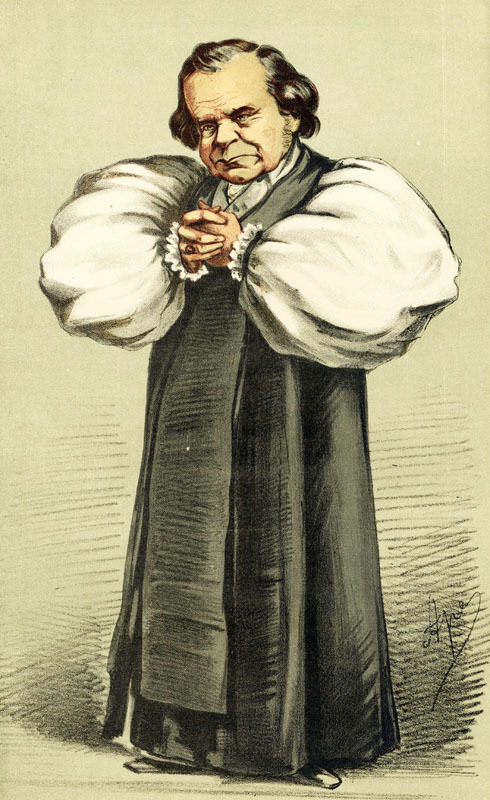 The Evolution Theory of Darwin is now generally accepted, although an astonishing 42% of the American population still thinks that the Christian God created humans more or less in their present form, about 10.000 year ago, according to a Gallup poll, held in May this year! 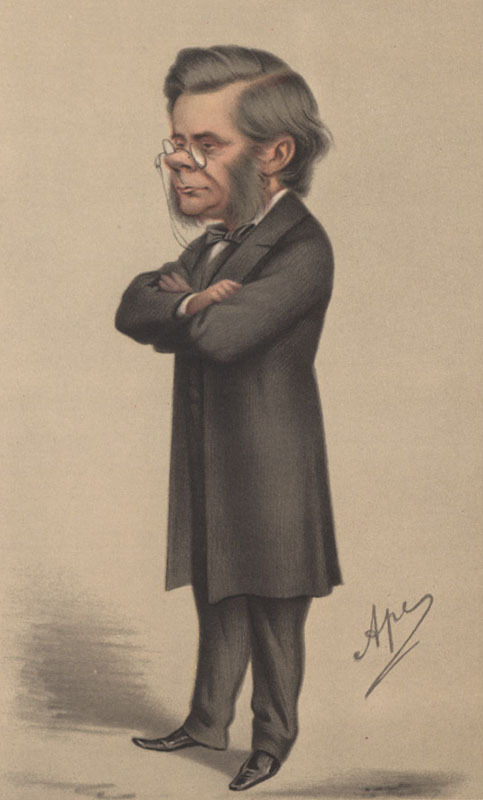 Huxley is said to have replied that he would not be ashamed to have a monkey for his ancestor, but he would be ashamed to be connected with a man who used his great gifts to obscure the truth. Actually both were wrong in assuming that humans descend from monkeys. Humans and monkeys have a common ancestor which may have resembled neither a human nor a monkey. Our closest relatives are the chimpanzees and the bonobos and our Last Common Ancestor (LCA) is estimated to have lived about 6 million years ago. For the LCA with the gorilla we have to go back ~ 7 million year, for the orang utan ~ 14 million year and for the gibbon ~ 18 million year. Here is our extended family, in a diagram and as a collection of (baby) photos. Of course the story does not end here. Our extended family belongs to the class of the “placental” mammals, together with mice, elephants, whales and bats and more than 5000 other species. The LCA of this (sub)class has lived around the time that an asteroid impact in Mexico may have caused the extinction of the dinosaurs, about 65 million year ago. Now, look at this picture carefully. This could be the (maternal) ~ 10 million-greats-grandmother of every living mammal, including you and me! Think about that for a while. You came from the womb of your mother, as she did from the womb of your grandmother. 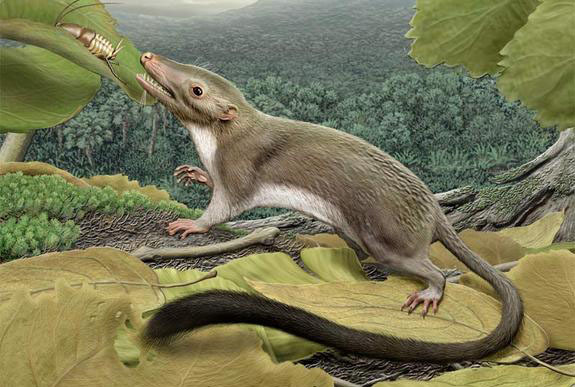 Repeat that ~ 10 million times and you end op with this shrew-like critter. 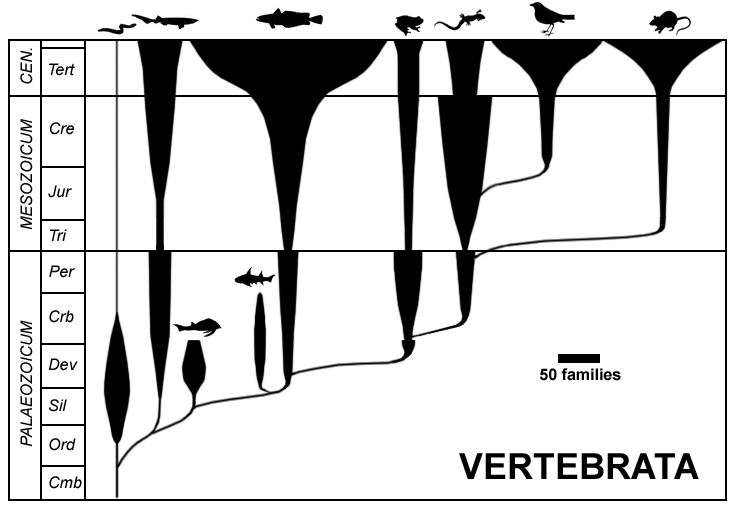 Look at this interesting way to show the development of the seven vertebrate classes. To the left you see the geological eras Cambrium, Perm, Trias etc. The thickness of the various classes indicates the number of families in the class. The Vertebrata phylum belongs to the kingdom of the Animalia, together with eight other phyla. The most important of them are the Arthropods (insects, spiders, lobsters, centipedes) Sponges, sea urchins, jellyfish, earthworms are all animals and have their own phylum. Confused by all these concepts like family, class, phylum, kingdom? 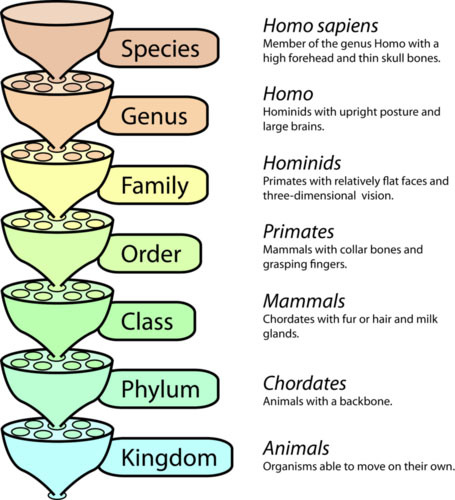 This part of biology is called taxonomy Here is a diagram of our human lineage. To keep it simple, I have skipped the category Order (we are Primates), taken the sub-class Placental Mammals and the sub-phylum Vertebrata, because the term is more familiar than Chordates. 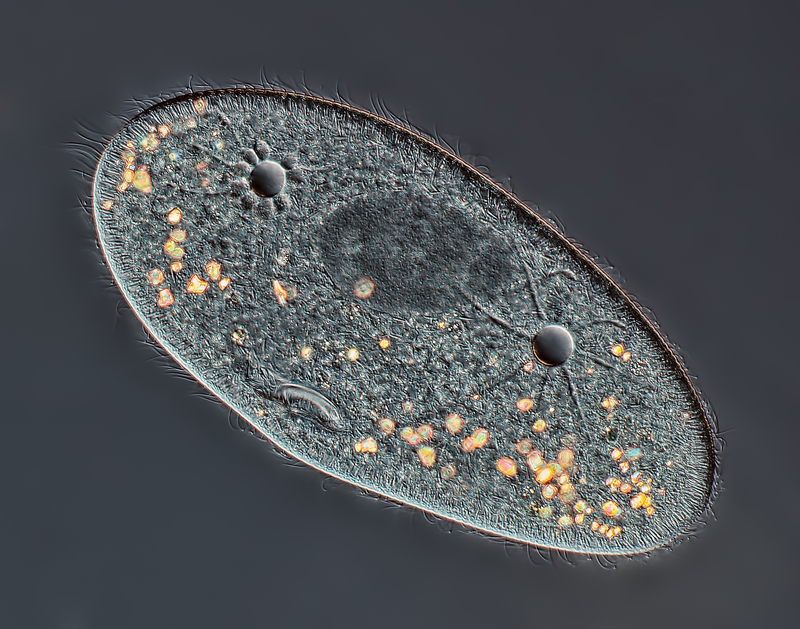 Keep in mind that there has been a Last Common Ancestor of you and this amoeba-like critter! Why are these kingdomscombined together? Because they share a very important property: their DNA is contained in a separate part of the cell, the nucleus. These kingdoms form the domain of the Eukaryota Here is a visual representation of the kingdoms in this domain. Again, keep in mind that there has been a LCA of all the organisms in this picture Although we have to go back far in time…:-) About 2 billion years, there is still a lot of discussion going on about the timing. But it is clear that developing a nucleus containing the DNA and organising the various functions of the cell was a major breakthrough in the evolution of life. Do cells exist nowadays that do not have a nucleus? Sure! There are two more domains where the cells have no nucleus. One of them will be familiar to everyone, the domain of the Bacteria. The other one is the domain of the Archaea, also a kind of bacteria and only recognised as a separate domain during the last decade. Click here if you want to know more about the differences between the two (warning, very technical). Bacteria are small organisms but there are many of them. The number of different species is unknown, estimates vary between 10 million and 1 billion…! They are everywhere! There are typically 40 million bacteria in a gram of soil and a million bacteria in a millilitre of fresh water. And don’t forget the bacteria in our own body. There are about ten times more bacteria in our body than there are body cells! On average about 2 kg in an adult human body, mainly in your gut. And important for your digestion, you would die without them. 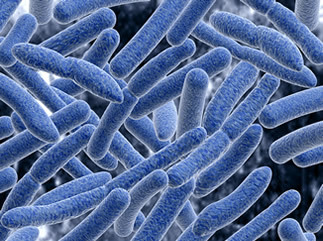 Here is a picture of the most common bacteria in your gut, the E. Coli bacteria. I will write a separate post later about bacteria and the human body. So, finally we have arrived at the beginning of life. 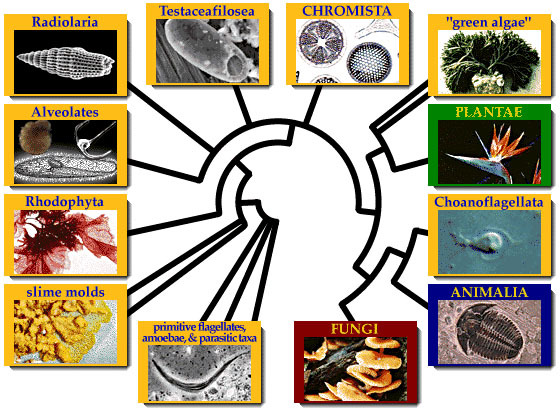 About 3.5-3.8 billion years ago there lived the Last Universal Common Ancestor (LUCA) of every organism living now. We do not know much about it. It may have lived in the deep sea, near to a volcanic vent. Read Four Billion Year-Old Mystery of Last Universal Common Ancestor Solved for more information. 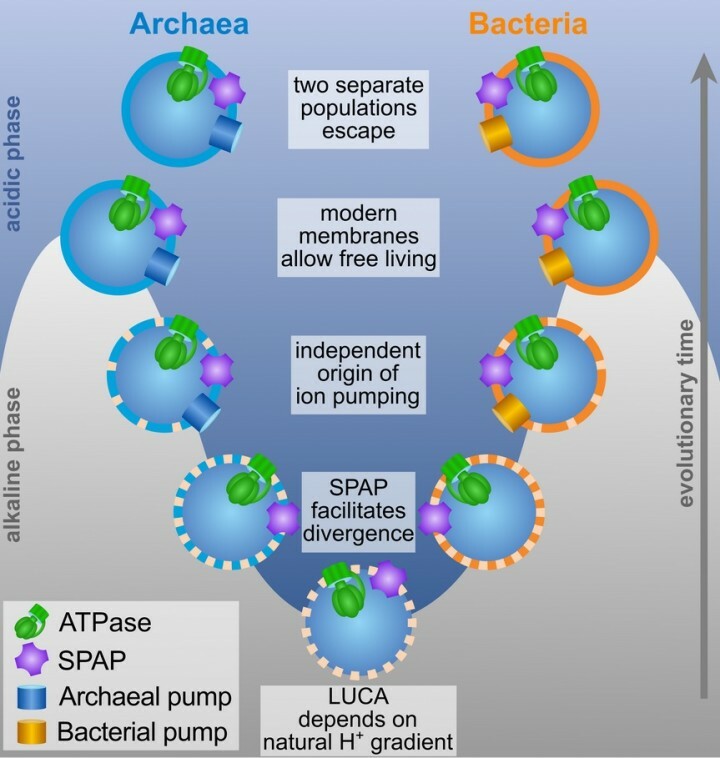 Here is a diagram from this site, showing the first major evolutionary split, in Bacteria and Archaea . 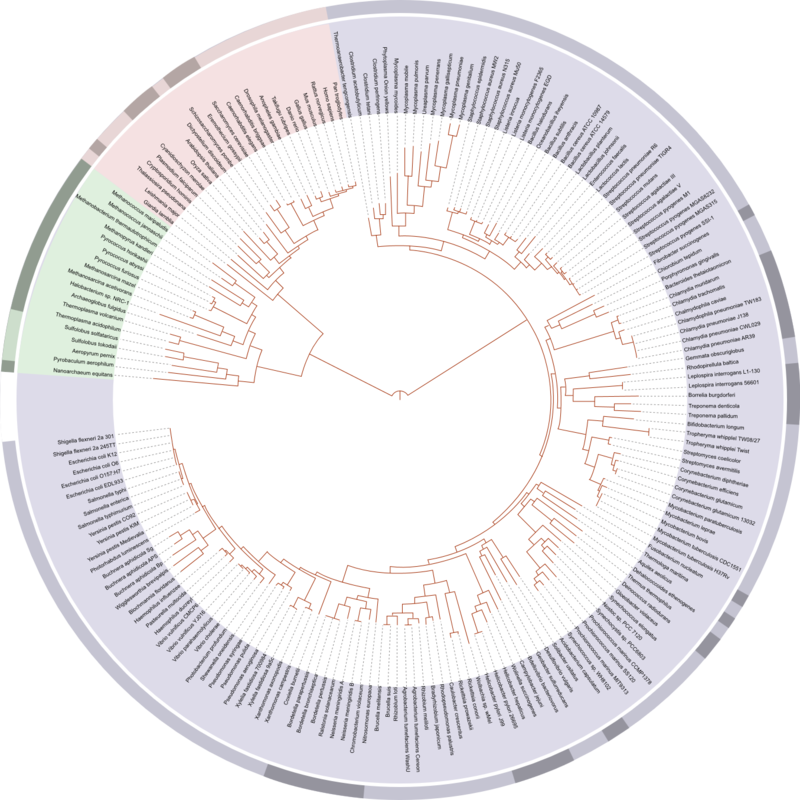 And here is the tree of life, showing the split in the three domains. 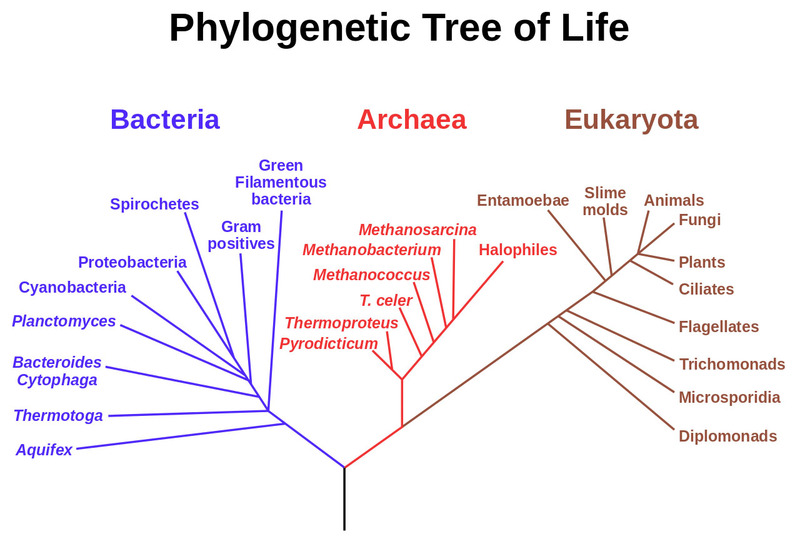 First the split in Bacteria and Archaea, with the Eukaryota branching off from the Archaea. Note that the Kingdoms of Eukaryota in the graph below have often different names from the names in the visual representation above. A clear sign how this field of evolutionary biology is still in development. A much more detailed tree of life, although looking less like a tree, you can see below. Click here for a larger version. In blue the domain of bacteria, in green the Archaea and in red the Eukaryota. Each domain showing some of its kingdoms in different shades. Try to find homo sapiens..:-) And notice how huge and complicated the domain of the Bacteria is. The names in the outer circle of this diagram are representative species in their kingdom. You can spend hours checking details in Wikipedia…:-) For example Anopheles Gambiae : Mosquito, Oryza Sativa: Rice, Takifugu rubripes : Pufferfish, etc. That a single tree of life can be constructed for all the living organisms, suggests that life has only started once on earth. If life arose repeatedly then all of the separate origins must have disappeared without trace. All living organisms belong to one big family with a common past of ~3.5 billion years. Isn’t that a nice conclusion for this post…:-)?